I really wanted a down or at least warmer running jacket for the winter months. 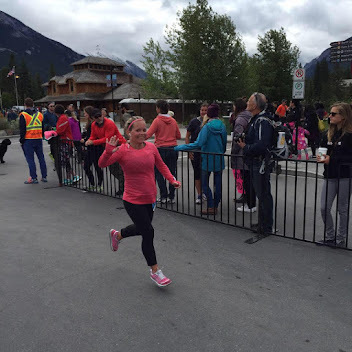 I had found the Run For The Cold pullover at Lululemon that I really liked but wasn't thrilled with the $178 price point. Luckily for me, it was put on WMTM for their boxing day sale, which actually started on Christmas Eve. I would have missed out if not for a friend posting about it on Facebook (yay social media haha). It was marked down to $78 and so I decided to take the plunge to buy it. I read all the reviews for the jacket since WMTM is final sale. I didn't want to waste $80 on a jacket if it wouldn't fit me. All the reviews said to size up in this jacket as it fit snug around the shoulders making it hard to get on and off. I usually wear a 6 so I crossed my fingers and ordered it in the 8. I also got it in black as white is a no go for me and I wasn't loving the plum - especially since I wear a lot of pink crb's and running shirts. When I received it in the mail, I was definitely happy that I sized up because I am pretty sure had I gotten my regular 6 like I do in all other jackets, I would have been so disappointed - it would have been impossible for me to move my shoulders or arms hahaha. The downside to having to order a size up to fit the shoulders was that it felt big everywhere else. 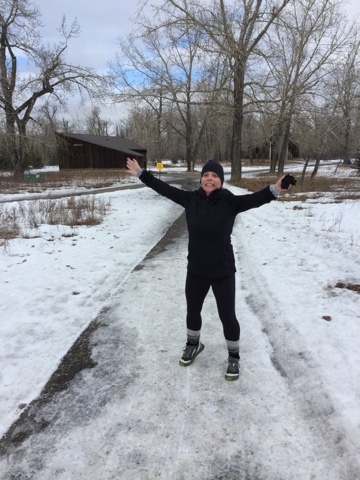 The upside to having the extra room was the ability to layer up on the really cold days that I actually got out for short runs. Despite the not great all over fit, I decided to keep the jacket and not try to sell it on any buy n sell sites. I really wish it was fitted all over and not just in the shoulders and chest area. They engineered this pullover with Primaloft Active Insulation and water repellant Fleece fabric panels to provide warmth without compromising mobility. Thermoregulation: designed with strategically weighted Primaloft Active Insulation to keep you warm where you need it most. We use synthetic insulation because it retains warmth when it gets wet. Sweat Management: This pullover has perforation and breathable side panels to help you let off steam and avoid chills after outdoor sweat sessions. Wear this over a sweat wicking base layer and under a shell to customize your thermoregulation. The cinched hood has been fantastic in the colder weather over top of my Lululemon top knot toque and my buff neck warmer. Some days were cold enough for all of that haha. 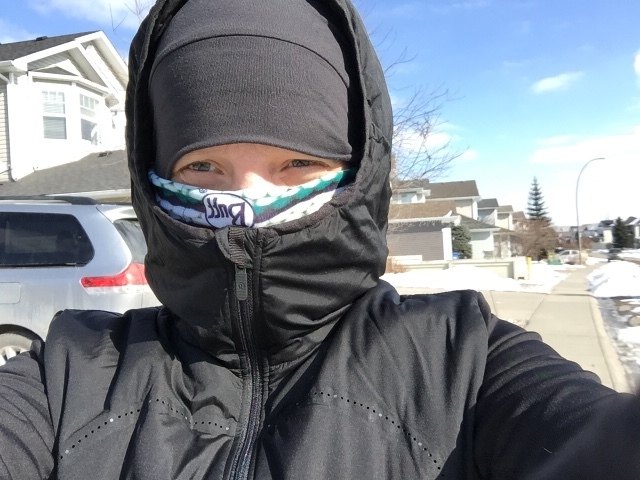 I use the front pockets to store my iPhone and to put my mitts and buffs and toques if I get to warm on a run. I have never used the back pocket even though they recommend it because it doesn't fit properly and I am not even 3% convinced that it actually wouldn't bounce on me. I have worn this jacket a lot - with layers, without layers, under my down jacket and shell and on long runs, short runs and hikes. It does smell pretty bad when you sweat though so it does get washed more then any other jacket I own haha. I have never felt cold while wearing this jacket and I love that when I start out wearing it and I get warm, I can pull out my arms without taking it off and tie the arms around my waist and not have to worry about it falling off or bothering me on my run. I don't run at night, but i appreciate the added visibility for my early morning runs before the sun rises for the day. At first, I thought it was just the fit I didn't especially love but tolerated about this pullover but soon I discovered that it pilled on the inside. It pilled a lot and it annoys me to no end and I know a few people who actually returned theirs because of all the pilling. I did think about doing that but I really like the functionality of this jacket and there were no other options available for me to turn to this winter. 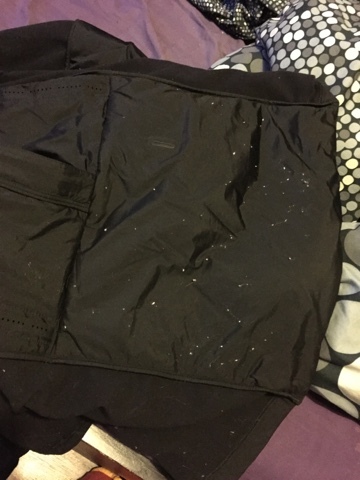 Most of the pilling is on the inside so not visible to the front which is good but it actually ruined one of my CRB's which made me unhappy but now I try to wear that one and instead of my nice lululemon running shirts, I use the free ones you get from races because I don't care if they get wrecked. It's a little disappointing that this has happened with a jacket I paid $80 for. I can't even imagine how I would feel about it if I paid full price for it. All that being said, I don't know if I would buy it again and I definitely don't think I would recommend it to any of my friends who were looking for a winter running jacket. 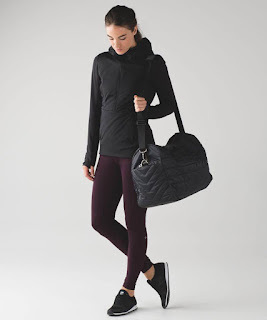 It's the first time that I have ever been disappointed with a lululemon product that I have purchased since I started wearing their clothes 12 years ago. I am really hoping that this is a one off instance and not a sign of things to come.